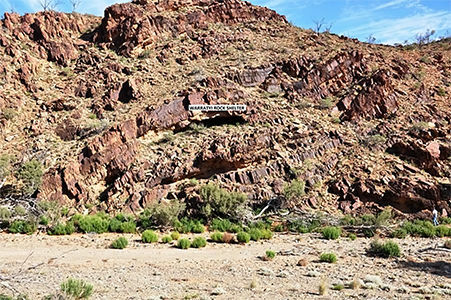 In a stunning discovery, a team of archaeologists in Australia has found extensive remains of a sophisticated human community living 50 000 years ago. 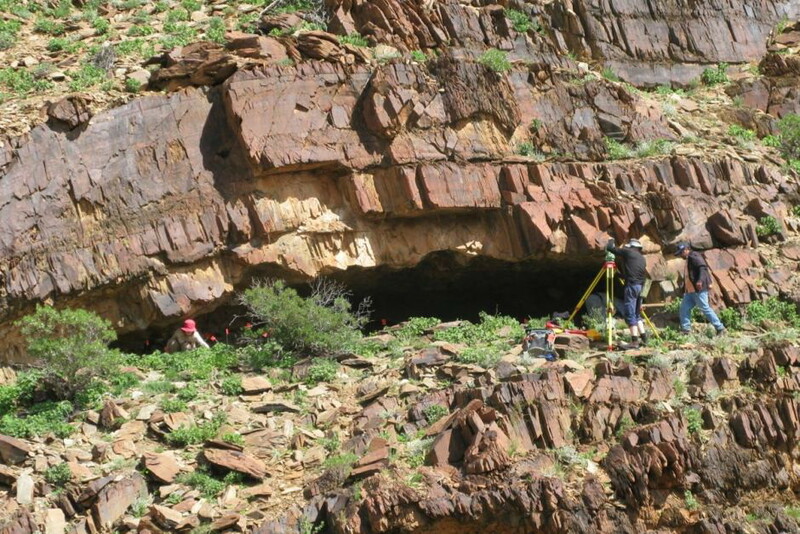 The remains were found in a rock shelter in the continent's arid southern interior. Packed with a range of tools, decorative pigments, and animal bones, the shelter is a wide, roomy space located in the Flinders Ranges, which are the ancestral lands of the Adnyamathanha. The find overturns previous hypotheses of how humans colonised Australia, and it also proves that they interacted with now-extinct megafauna that ranged across the continent. Map of where the Warratyi rock shelter was found in the Southern Australian interior. The thick dark line delineates where the arid regions of the continent begin, and it places the settlement (marked with a triangle) firmly within that area. Dubbed the Warratyi site, the rock shelter sits above a landscape criss-crossed with deep gorges that would have flowed with water when Palaeolithic humans lived here. From extensive excavations conducted last year, the archaeologists estimate that people occupied Warratyi on and off for 40 000 years, finally abandoning the site just 10 000 years ago. 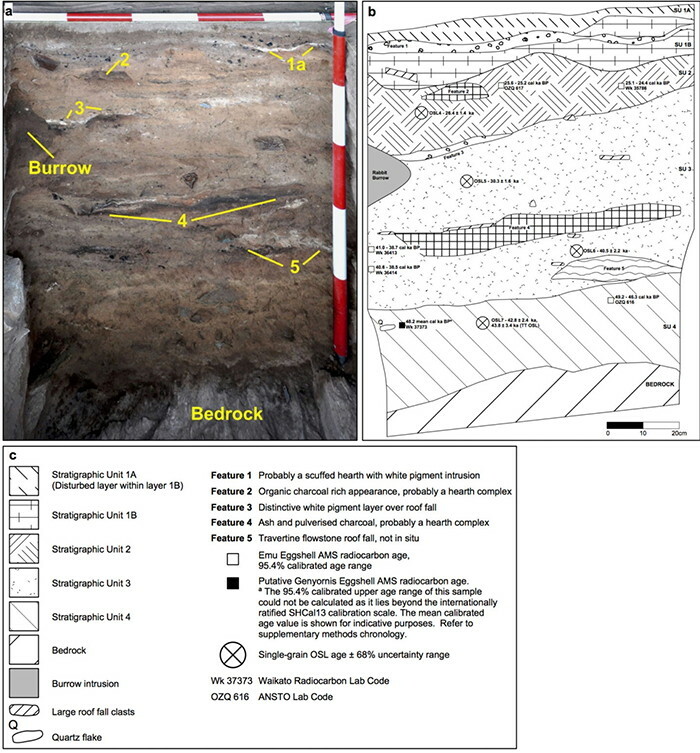 By analysing layers of earth in the shelter, the scientists were able to construct a timeline of settlement in the space. They used carbon dating on nuggets of hearth charcoal and eggshells to discover that the shelter was first occupied about 50,000 years ago. They also used a dating technique called optically simulated luminescence (OSL) on buried grains of quartz. This technique determines when those quartz grains last saw sunlight and heat. 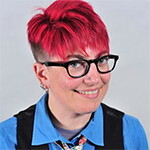 Both techniques returned similar dates, adding to the researchers' confidence in their findings. 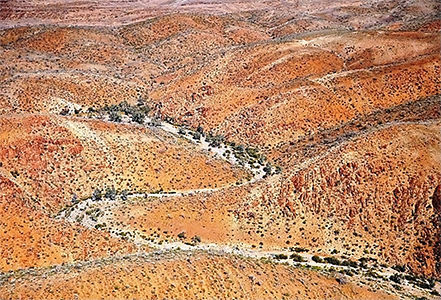 This makes Warratyi the oldest evidence of human occupation in the arid Australian interior, long believed too hostile for ancient people who had few tools. 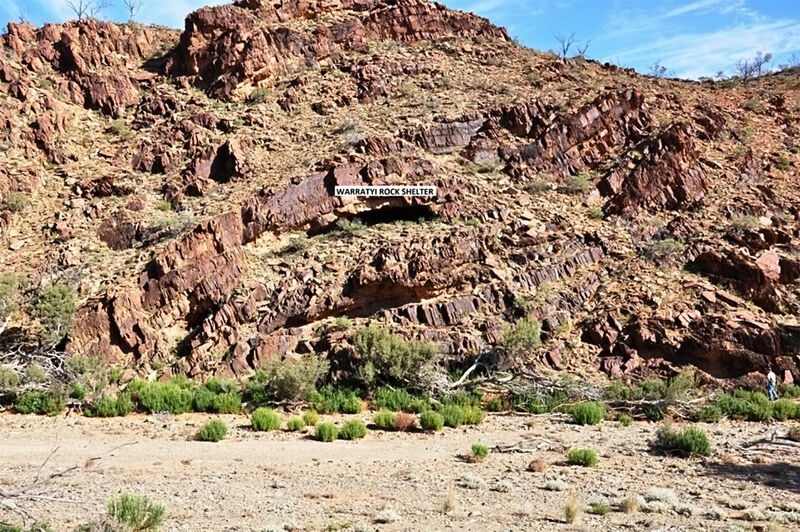 But these findings make it clear that the ancestors of Australia's indigenous people were, in fact, seasoned explorers who could survive in difficult conditions. 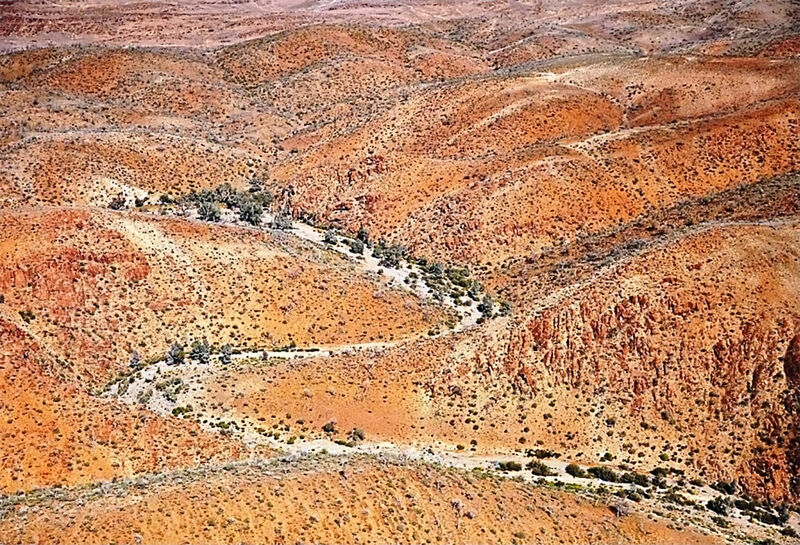 Aerial view of the Northern Flinders Ranges, containing incised creek valleys and gorges, where Warratyi rock shelter was discovered. Here you can see the Warratyi rock shelter. During the period when it was occupied, it would have looked out over a winding stream. A sharpened bone point, dated to 40 - 38 thousand years old, and now the oldest bone tool yet found in Australia. It was likely made from the lower leg bone of an animal similar in size to the Yellow Footed Rock Wallaby. 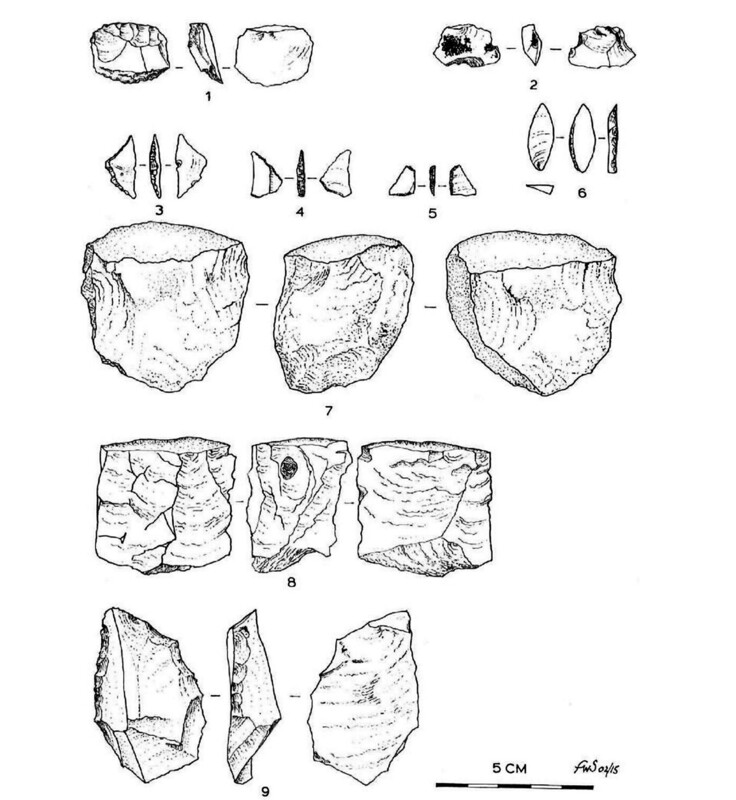 A drawing of representative rock tools discovered, showing the range and complexity of the technology that humans used at Warratyi. The earliest signs of habitation, older than 38,000 years, showed a human culture that was sophisticated for its time. 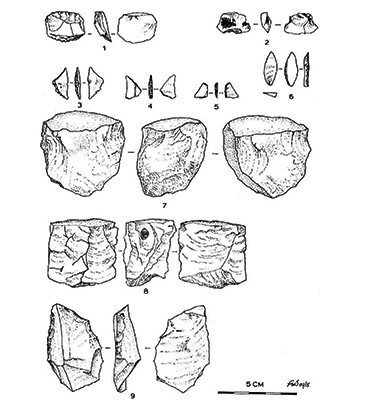 The people of Warratyi had a wide range of tools, ranging from tiny handheld blades to bone awls. They had two colors of pigment, white and red, for use in art, body decoration, and possibly adhesive. They were accomplished hunters and gatherers, using many kinds of blades to butcher animals and cut plant stalks. Thousands of discarded bones and eggshell shards were buried at Warratyi, representing 17 different species. Two of those species, Diprotodon optatum (a massive creature the size of a rhino) and Genyornis newtoni (an enormous flightless bird) are extinct megafauna. Neither would have naturally found its way into the cave, so their bones and eggshells must have been brought there by humans. This proves that humans hunted, ate, and interacted with Australia's megafauna for a considerable time, over a considerable range, before the beasts died out. 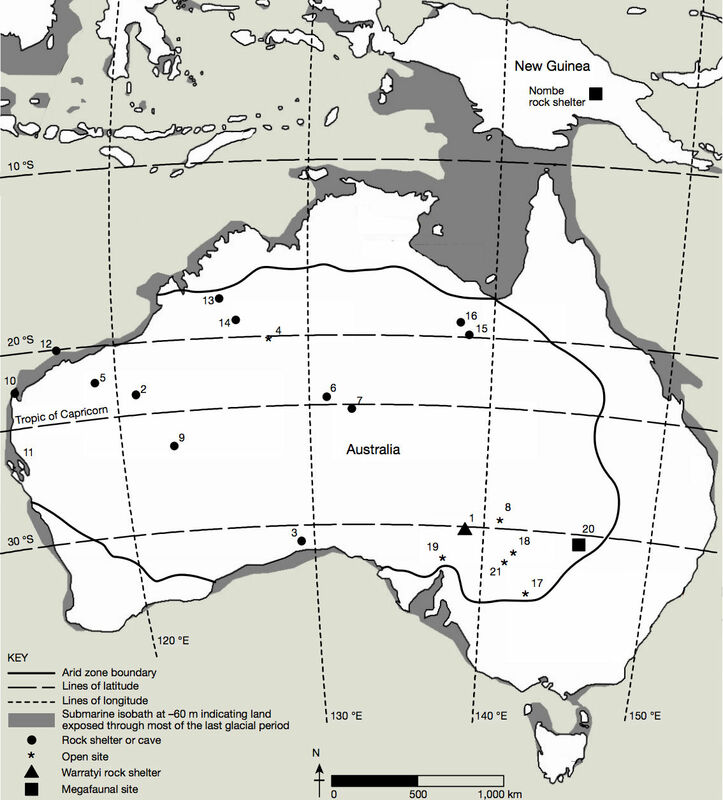 These findings also provide solid evidence for what archaeologists have long suspected, which is that humans in Australia had an impact on the lives (and extinctions) of megafauna across the continent. What's truly incredible about Warratyi is the story it tells about how humans first populated Australia. We're still certain that the early human explorers island-hopped from southern Asia to Australia in reed boats. But archaeologists have long believed that these people settled the continent's coastal regions for thousands of years before broaching the deadly interior. Part of a Diprotodon bone was found in the Warratyi rock shelter, likely the leftovers from a meal over 45 000 years ago. An adult Diprotodon (Diprotodon optatum) was a megafauna herbivore weighing approximately 3 tons and 4 metres in length. 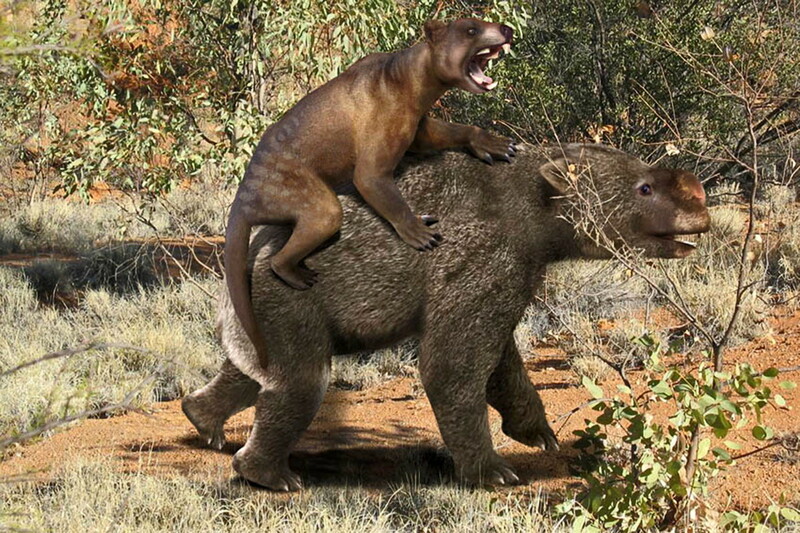 ( Shown here is a Diprotodon being attacked by a marsupial lion, Thylacoleo carnifex. The attention to detail is impressive, in particular the type of grasses, bushes and trees in the painting, which are recognisably Australian flora. Coupe - This stratigraphic diagram of one part of the site shows the time sequence. Lower layers are older, and all four layers correspond to roughly 40 000 years of occupation, from 50 000 to 10 000 years ago. 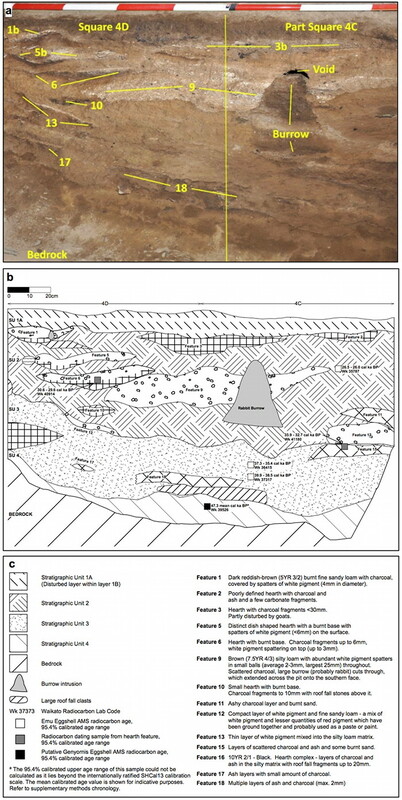 Another stratigraphic diagram of the site, noting where the ochre, gypsum, and charcoal were found. The scientists did a chemical analysis and carbon dating of these substances to verify their composition and age.